The Tacky Glue Trap is a Physical weapon. The King provides this trap or the High Tension Spring (if starting the game through Facebook or the web page) or Mouse Hot Tub (if starting the game through the mobile app) to Hunters who are joining the hunt for the very first time. If you believe the simplest answer is the best, then white glue and some cheese is the way to go! 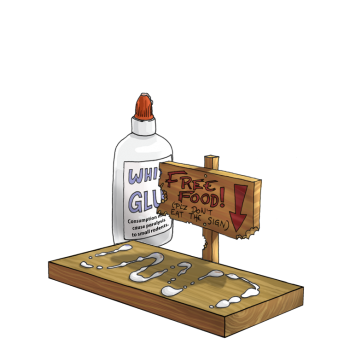 The Tacky Glue Trap can be purchased for 550 gold from the Town of Gnawnia Trapsmith. It refunds for 100 gold at the same location. High Tension Spring – An alternate trap that Hunters can choose to receive from the King when they first begin hunting. Mouse Hot Tub - An alternate trap that Hunters can choose to receive from the King when they first begin hunting, if they start playing through the mobile app. Chrome Tacky Glue Trap – A Limited Edition version of the Tacky Glue Trap, which has 18 more luck but 10% less attraction bonus. A complete list of all weapons can be found here. The wording on the signpost in the trap art states "FREE FOOD! (Plz don't eat the sign)". The wording on the glue bottle states "Consumption may cause paralysis to small rodents."